Read an extract from a book of science fiction short stories written by Irish writers. A NEW COLLECTION of Irish short stories shows that writers here have been finding new ground in sci-fi for over 100 years. A Brilliant Void, published by Tramp Press and edited by Jack Fennell, has work in it that dates back to as far as the early 19th century, but the topics are anything but old school. For example, Irish writer Tarlach Ó hUid anticipates the plot of Back to the Future – 40 years ahead of Michael J Fox’s DeLorean journey – in his story The Chronotron. In Ó hUid’s story, the time-machine car is trying to go and avert the Civil War. Amazing too, that as far back as 1895, Amelia Garland Mears imagined in her novel Mercia, The Astronomer Royal, a case familiar from any number of recent headlines: an Emperor assaults his astronomer, and then lies to the media about it; a court case ensues, during which it emerges that a recording device has captured the whole sordid scene. In the MeToo era, this is the kind of story we are very familiar with. The novel ends with Mercia vindicated and the Emperor humbled. In Garland Mears’ future, supposedly ‘untouchable’ men are held to account for their transgressions against women. In A Brilliant Void editor Fennell says the stories “boldly take readers where they have never gone before”. 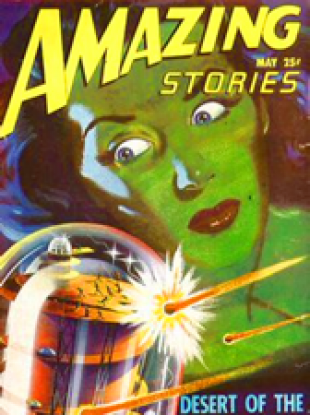 The stories in A Brilliant Void date from 1837 to 1960, and Fennell says that what all of the authors have in common is the science fiction material they created “has been somewhat neglected”. To give a taste of the stories, we have an excerpt from The Exile by Cathal Ó Sándair (1960). In it, a young man from Kerry decides to emigrate to the Moon to seek his fortune. “The more things change, the more they stay the same,” says Fennell. The Government of Luna welcomes young men and women between 18 and 25 years of age. The Government will cover the cost of the journey from Earth, and migrants will be employed as soon as they arrive. Additional information and a free booklet, Your New Life on Luna, can be obtained on request from the Lunar Information Office, O’Connell Street, Dublin. For a good while before he spotted this ad, Sean Murphy had been entranced by all aspects of space travel. In addition, there were few households in the community that did not already have a family member that had gone to the Moon to seek their fortune. There were good wages to be had in the glass-canopied Lunar cities, and there was no rain up there either. Sean already knew all of that, but his mother never dreamed that he would ever actually consider going. She never imagined it – until she saw the envelope of the letter that came for him from the Selenites’ office in Dublin. She left the letter in a place where Sean would see it; having done so, she gave a broken-hearted sigh. Her husband was long dead, and except for Sean, her children were all married, and none were living nearby. She had been hoping that Sean might marry one of the local girls, and that they might keep her company in her old age. That afternoon, Sean spent a long time reading the booklet that the Lunar Information Office had sent; obviously, the images contained therein were delightful. One of them was a picture of a spaceship that had just landed at a Lunar airport (the famed Airport of the Moon, obviously), full of passengers from Earth. There were pictures of Luna’s capital city; pictures of the wonderful factories situated there; pictures of its theatres, and its elegant hotels – and yes, pictures of the statues, monuments and works of art that that been created in honour of Captain Spéirling, the Irish space-pilot who first established contact with the Selenites in 2007. Sean Murphy’s mother did not ask him any questions about the letter. Over the following week, however, her heart was almost torn asunder with worry – and, in fairness to the poor creature, this worry was not baseless. A week after the letter arrived, Sean spoke to her about it. His poor mother did not know what to do or to say. She wanted to hug him and beg him not to leave her there, old and lonely, but she did not give in to this urge. She remembered those young men whose mothers kept them at home; and she remembered how some of those men turned sour, as if they had suddenly aged. Sean was deeply moved to hear this, and the tears were not far from his eyes in that moment, because he knew how impossibly difficult it was for his mother to let him go. Even so, that night she cried herself to sleep. She had little hope that Sean would return as early as he said he would. Of those she had seen go to Luna, few of them came home before twenty years had passed, and she was sure that she would be dead and gone before that time was up. The end of the month came, and Sean went. He got the atomic train up to Dublin, and after that, he boarded the space-ferry. He got a good job in one of the huge Lunar mines, and three years later, he had been promoted to a kind of manager. A week after this promotion, however, he received a message from home – his mother was dead, and she had already been buried alongside his father. Jack Fennell is the editor of the new anthology A Brilliant Void: A Selection of Classic Irish Science Fiction, published by Tramp Press as part of their Recovered Voices series. Email “An Irish science-fiction story predicted the plot of Back to the Future”. Feedback on “An Irish science-fiction story predicted the plot of Back to the Future”.